The deadly loss of an entire ship’s company at night. During the deployment, Rear Admiral Sir Robert Aubuthnot, ran dangerously close to Vice Admiral Sir David Beatty’s flagship. 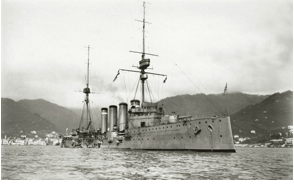 In fact, of his four ships, only two managed to cut across – HMS Defence and HMS Warrior. The Duke of Edinburgh and HMS Black Prince got left behind. Searching for her sister ships in the night, Black Prince, stumbled on the entire German battle line and was blown to pieces. I’ve been over her wreck on the North Sea in April 2015 and seen the extended hull torpedo launch ramp. She went down fighting. 857 officers and men to their graves. 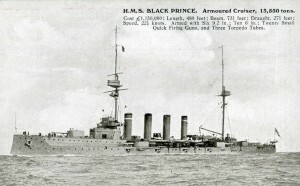 Kenneth King’s grandmother’s brother, Jack Butlin, died on HMS Black Prince. when she mistakenly thought that the line of ships she had found in the night were “friendlies”. The German line was between 750 – 1,200 yards distant. At that distance they did not have a chance although they had managed a turn away and were launching torpedoes at their aggressors. Dr. Innes McCartney was able to work out the ship’s direction of turn.